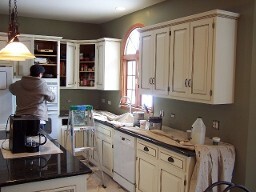 Save Wood Kitchen Cabinet Refinishers has been serving the greater Chicagoland area for the past 27 years. We come to you with samples. Once you've decided on a desired look, we will make a sample on one of your doors for your approval. Most of the work is done in our shop as to not interrupt your life. We do need to be in the home for 5-7 days to finish the framework of the cabinets. All cabinets are cleansed for removal of grease, wax, oil and dirt. Then, all damaged and worn areas are primed, finished and sealed. Two beautiful top coats are applied of clear polyurethane on all cabinets for protection and beauty. Our mission is to serve you with quality workmanship, great service and in the end, beautiful kitchen cabinets at an affordable price!